Which types of beer are commonly used to create half-and-half beers? In frequent recipes are only beers of contrasting colours being used (like pilsener vs porter or pale lager vs stout) or other combinations are being commonly used too? What are some of the most popular recipes? 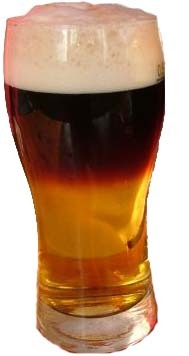 In a Half and Half (also known as a "Black and Tan" in certain locations), the primary factor will be the density of the two beers -- one beer must be of a lesser density than the other to stay afloat. Contrasting colors are used for visual effect; otherwise, how might you know one was floating? Common recipes involve floating the less dense Guinness over a Bass, or a Guinness over a Harp Lager. Its Guinness' particular light density that makes it a good candidate for so many half-and-half style recipes. I think it all depends on your personal preference. There are many different combinations out there such as the Black and Tan, but some companies have also started coming out with six packs that they intend for you to mix. Shock Top, for example, released a six pack that featured their Chocolate Wheat and their Belgium White. What I would do is think of a dark beer you enjoy and then a lighter (but still flavorful beer) that you like and just experiment with mixing them. In my case I would choose to mix Left Hand Milk Stout and a Kentucky Kolsch. Let me know what you try! I am curious! A half and half is a Guinness with Harp. This style of beer combination is accomplished by using a dense beer on the bottom followed by a beer of lesser density on the top (usually poured over a spoon to ensure that it doesn't sink through). Personally when creating a "Half and Half", Guiness is the only constant. The other beer is usually something only lighter in color. Wheat beers have an interesting flavor. IPA's have their bitterness cut when made into a Half and Half. Guinness isn't the only dark beer to layer with. Porters can be used to as a bottom layer to give you a dark-on-bottom drink. Check it all out at The Perfect Black and Tan. It is more than color. You need the other beer to have a different density from Guinness, at least if you want it to stay separated for any length of time. And be careful which Guinness you use because there are a number of them out there with different "strengths". If the densities are too close, they'll mix together. A good starting point in selecting interesting combinations is to look at the densities across different styles. Pick two that are widely different and find bottles of each. For instance, if you take a bottle of a kriek (red-looking fruit lambic), it would probably float nicely on most other beers, but you'd want to pick a nice, dark beer to show off the contrast (plus, if you used a kriek (cherry) or frambois (raspberry), pairing it with a porter or stout that has nice chocolate tones would taste very nice). Likewise, just about anything would float on a bock or a strong scotch ale like a "wee heavy". I just asked for a half and half but this place didn't have Guiness so the bartender told me to try it with Murphy's and Harp instead. Total fail. The densities were too similar and one mixed into the other. Not awful flavor just not a Black and Tan. Not the answer you're looking for? Browse other questions tagged colour beer-cocktails or ask your own question. Why do some beers seem to make people feel more full?